Observation - Jackdaws (Corvus monedula) - UK and Ireland. Description: A rather large flock making a hell of a noise on a sunny Sunday afternoon walk. The numbers suggest Jackdaws as opposed to Crows. 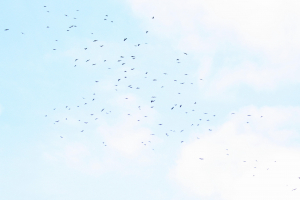 A rather large flock making a hell of a noise on a sunny Sunday afternoon walk. The numbers suggest Jackdaws as opposed to Crows.